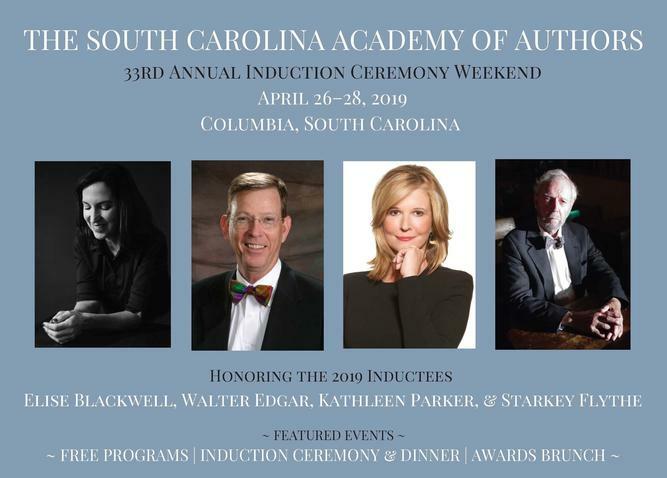 Join the South Carolina Academy of Authors (SCAA) in Columbia, South Carolina, on April 26-28 for the SCAA’s 33rd annual induction weekend, honoring Elise Blackwell, Walter Edgar, Kathleen Parker, and the late Starkey Flythe. South Carolina Humanities supported this programming with a Fast Track Literary Grant. The South Carolina Academy of Authors is the state’s literary hall of fame, each year inducting a new group of honorees in a weekend of educational events and culturally enriching gatherings. Since its formation in 1986, SCAA has inducted 81 writers, living and deceased, from across the breadth of the genres and geographies represented in South Carolina’s literary life. The statewide educational mission of the nonprofit SCAA is performed by an all-volunteer board of governors and by past inductees. The 2019 induction weekend includes “An Evening with Starkey: A Gathering of Friends Reading Selections from His Works” on Friday, April 26; a ticketed brunch on Sunday, April 28 honoring the 2019 winners of the Coker and McCray Nickens Fellowships and Student Prizes; and the ticketed induction ceremony and dinner on Saturday, April 27 at 6:30 p.m. at The Carolina Room at Capstone Conference Center in Columbia. More information about the South Carolina Academy of Authors and the 2019 induction weekend can be found on the website at: http://www.scacademyofauthors.org/induction-ceremony.html.